Recently, LS Quarry obtained approval from the Department of Economic Development, Jobs Transport and Resources (DEDJTR) to expand the Work Plan extraction area at Lima South Quarry Site. The expansion provides ongoing job security to around 45 local people employed by the LS Quarry Group, as the life of the quarry has been extended. This is fantastic news for local employment. It is also good news for the environment. As part of the expansion, the LS Quarry Group purchased a 200-acre bush block nearby. Over 50% of this land is to remain as bushland as an offset for vegetation removed from the Quarry. The land will provide habitat for plants and animals, delivering a range of ecosystem services that make the land more productive, contributing to human well-being. 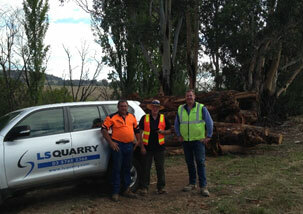 In another win for the environment, LS Quarry are working with the Goulburn Broken Catchment Management Authority (GBCMA) to reuse the trees removed from the quarry in Lima South. The GBCMA are using these trees to re-snag local rivers and streams to improve fish habitat which is proven to increase overall fish numbers and enhance aquatic life in the waterways. “We are pleased to be able to help the environment while at the same time securing the future of the Lima South Quarry and our employees,” said Managing Director of the LS Quarry Group Mr. Ashley Day. “It’s good to be working in with local business to achieve positive outcomes for the environment” added GBCMA Officer Mr. Geoff Brennan.